Fox 2-Quart Plastic Canteen OD | BUDK.com - Knives & Swords At The Lowest Prices! 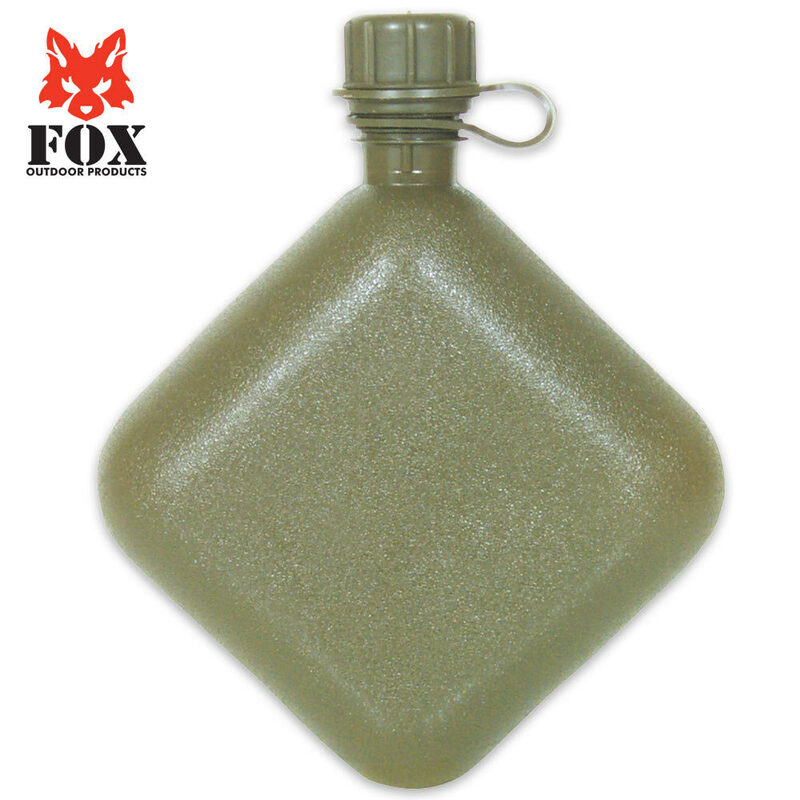 If you're looking for just a great quality canteen, a Fox canteen will always fit the bill. This 2-quart canteen is made of rugged, heavy-duty but pliable OD green plastic that will definitely withstand the elements. The sturdy hard plastic cap provides a leak-free seal. This product is proudly made in the U.S.A.
Fox 2-qt. canteen is excellent-must-have must buy! Excellent product. Well made, light, and doesn't leak. Will buy more w/covers. Good quality canteen. Tried it out yesterday on a hike with the family and it held enough water for all of us. The canteen is made in U.S.A. It does not leak and lighter than expected when filled. Good price I would buy again. If your looking for a 2 quart canteen this is it. Buy the cover with it and you will not be disappointed. I also bought this with the cover, and the M1 cap to connect it to my M10M gas mask. It's surprisingly lightweight even when fully filled with water, and can hold enough water to keep you going for a long time out in the wilderness. This is an absolutely fantastic essential to any bug-out bag or survival kit. I haven't had a chance to try out my canteen, but I bought two of them with the covers and I'm Happy I have them. I'm getting them to go with my "Bug Out Bag". I'm building a small portable one man survival kit ready for anything! And Yes...I'll be ordering MOre stuff from you! My canteens and covers came fast, the service is excellent. I Have had to call customer service and my problem was fixxed fast and easy! THanks! !